New systems, familiar features, and a spectacular setting make for one of the strongest games in the series. Putting an end to the machinations of the corrupt inner circle of Egypt's ruling class is on hold for a bit: first I gotta help this peasant boy I met thirty seconds ago, whose ox cart was stolen by bandits. Priorities firmly in order, I circle the bandit camp on horseback, dismount, creep close, take aim with my bow at the nearest bandit, and fire. Actually, I fire and then take aim: I have a skill that allows me to control my arrows in midair and in slow-motion. My arrow sinks into the bandit's shoulder, and he spins around and spots me. The slow-motion feature of my bow skill doesn't just give me an advantage, it also allows me to see things I otherwise would have missed, such as what happens next. The bandit and I attack at the same time, me with my second arrow, him by throwing a fire bomb. My arrow and the bandit's lobbed grenade pass each other in midair. The bomb strikes the sand and explodes, the flame from the explosion lights my airborne missile on fire, and there's a satisfying fwoosh of my arrow igniting just before it hits him right between the eyes. The bandit drops, felled by a flaming arrow we created together. It's one my favorite moments in Assassin's Creed: Origins, a game packed with great moments thanks to a world of tools and systems that can be used together to deadly (and sometimes comic) effect. Some of these systems are new, some are from previous entries in the Creed series or other Ubisoft games, and they blend well, with the familiar feeling satisfying and the changes feeling refreshing. Origins is perhaps not as great as Assassin's Creed 2 or as invigorating as Black Flag, but it's damn close. Origins is a damn big game in an even bigger world. In Origins you play (most of the time) as Bayek, Egypt's last medjay (sort of a freelance cop, with a badge and everything), whose grim tale of personal revenge and earnest desire to right wrongs among the locals soon spreads into a quest to rid Egypt of corrupt, powerful, anonymous figures who operate behind the scenes. 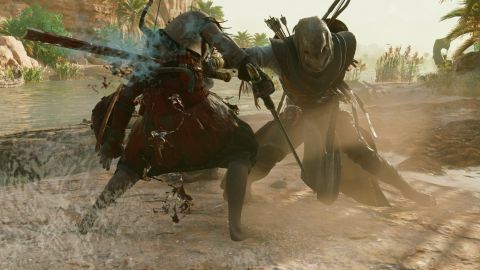 Bayek isn't just a warrior but also a detective: investigating and stalking his prey, first rooting out the true identities of these shadowy figures, then infiltrating their lairs and sanctums, and finally putting an assassin's blade through their necks. (And then having a lengthy conversation with them—this is Assassin's Creed, after all.) Bayek's quests take him from his small home village of Siwa to the great pantheons of Alexandria to the Nile Delta and beyond, and lets him rub shoulders with figures like Julius Caesar and Cleopatra. The Egypt of Origins is a stunningly lovely place and I spent a lot of time simply soaking in the sights. Some areas of the map are expansive barren deserts or open seas, and while seemingly desolate of quests they're still well worth exploring to discover their few curiosities and surprises. Towns and villages are bustling with citizens, farmers, workers, and soldiers. There's plenty of dangerous (and eventually tamable) wildlife from vicious crocs and hippos lurking in the Nile to lions and hyenas prowling the sand dunes and rocky hills to flamingos and egrets that take flight when you thunder past on horseback. The simulation in Origins doesn't go below surface level, but if not a living world it's at least a lively one. And wow, it's big. After 35 hours of play, when I'd completed the main quest, tackled tons of side quests, solved puzzles, collected treasures, killed scores of enemies, and done lots of free-form exploring, hunting, and looting, there were still entire darkened regions of the map I hadn't yet set foot in. Origins is a damn big game in an even bigger world. How the world is divided up isn't my favorite thing ever. It's MMO style, with different regions appropriate for different character levels. If you're level 8, and you cross a border from a region marked for levels 7-9 and into a region marked for level 17-20, well, nice knowing you. No matter your skills and gear, you simply can't take on an enemy too high above your own level: your attacks just won't do enough damage and their attacks will one-hit murderize you. This gives portions of the map a feeling of artificial difficulty, an open world where you're free to go anywhere but not really free to do anything, at least until you've leveled up. When you begin playing you can make a beeline for Giza's pyramids or Krocodilopolis: maybe you'll get there in one piece, or maybe you'll be insta-killed by a hyena that's 15 levels above you. While I don't care for that particular brand of world creation, I didn't feel stifled by it that often. There were always enough level-appropriate areas to visit, explore, quest, and fight in (plus revisiting a low-level area when you've grown far beyond it can make you feel like a living god, which is pretty satisfying). And for the first time in what feels like a long time for Ubisoft, the world is filled with things to do without going overboard and looking as if someone spilled an overflowing sack of icons on a map. There are plenty of distractions as you ride from quest to quest, and lots of diversions to come across while exploring, but it never feels bloated or over-stuffed with tasks that require you to hop off your camel every few feet or disrupt your progress with the distraction of endless collectibles. Assassin's Creed Origins is a heavyweight when it comes to system requirements. Your graphics card is still the most important factor, but the CPU will play a role, particularly with faster GPUs where it can become a bottleneck. AMD cards also struggle to hit higher framerates, even at lower quality settings. Check out our performance analysis for more details, including CPU scaling results. Here's what we found so far: On a Core i7-6700K (stock) with a GTX 980, we've been recording around 50% CPU utilization with occasional spikes to 75% or higher. With a GTX 1080 Ti, we're seeing closer to 70% CPU use, even with an i7-8700K. Ubisoft lists the minimum CPU as an i5-2400S, but bear in mind that's likely only going to get you 30-ish fps, not 60 fps. If you can meet the relatively high system requirements, though, Origins has been stable and easy to alt-tab in and out of. We've run into some small glitches and dialogue miscues, but haven't encountered any game-breaking or major bugs. By now, Ubisoft knows we love infiltrating camps, forts, and strongholds, and there are lots of them in Origins. Some are small outposts (one is literally just some guy's house), while others are massive fortresses or palaces with dozens of patrolling guards and several captains and commanders. Taking down a fort is pretty much always a blast: observing, sneaking, picking off guards one-by-one, and of course the enjoyable mad scramble on the occasions when stealth goes wrong. Throw in random variables like wild animals attacking or the unexpected arrival of a handful of passing soldiers or the onset of an eye-blotting sandstorm, and no two camp assaults feel quite alike. Helping you plot your incursions is your faithful pal, Senu, an ever-present eagle whose eyes you can look through as she circles overhead. A glance from Senu will tag enemies, animals, treasures, and infiltration points. Unlockable skills let you use Senu as a distraction, as she can harass enemies and even show you the future path of an enemy as they stroll through camp. Not only is Senu a fun and useful tool, she makes long journeys more enjoyable as you can look through her eyes for a beautiful and serene view of the landscape. Origins also has gladiator challenges, chariot races, several types of brief radiant quests, and a few arenas in which to fight armored, rampaging elephants, if that's your particular dream. One of my favorite activities is a quieter, calmer one: a series of papyrus scrolls, which act like treasure maps. First you have to find the scrolls themselves, then decipher a riddle which leads you to leveled loot somewhere else on the map. It's a fun activity that promotes exploration, and takes you to areas you may have overlooked otherwise. For those hoping for more Black Flag ship-to-ship combat, there is a bit, but only in a few self-contained sequences. Combat in Origins is based on dodging, blocking, and attacks of different speeds depending on the type of weapon you're using, complemented with unlockable skills. It can sometimes feel a bit mushy: dodging, in particular, can be finicky when you're locked onto enemies, and later in the game I became so reliant on a shield bash skill and a single charged strike that fights, while fun, became fairly identical. The new system could use some refining, but I wound up preferring its more methodical approach to previous Assassin's Creed animated combo moves. There's also a great series of enemies called the Phylakes: a handful of imposing and ridiculously powerful warriors who individually prowl the map looking for you. They've got massive health bars and brutally deadly weapons, and I found myself loving how unfairly difficult they are to beat. There I am, an unstoppable badass with magic weapons and improbable skills, riding triumphantly away from a fortress of soldiers I'd just easily slashed and stabbed my way through. Then I'd spot a Phylake approaching on the road ahead, and would be forced to slink off and hide in the bushes quietly until he had passed. The Phylakes are humbling, and being humbled occasionally is a good thing. At one point, when I was level 32, I encountered a level 20 Phylake. I cockily unequipped all my weapons, thinking how satisfying it would be to exact my revenge on one of these super-powered bastards with my bare fists. Uh, nope. He was still too tough. I had to switch back to blades halfway through the fight to finish him off. I had a few issues with the pacing of Origins' main questline. The first group of assassinations—including the introduction, tutorials, and early batch of side-missions—felt as if they blended together perfectly, ushering me on at just the right time and level. At times, however, the gap in suggested level between main quest missions felt a bit too wide, sometimes even during a single quest. I completed the first part of a main quest marked for level 25, and the second half of the quest was marked for level 28, but I hadn't advanced enough to feel like was achievable. So, I had to spend time scouring around for local side-missions and other activities to grind enough XP to continue, losing the flow of the quest in the meantime. Things evened out more with the last of the main quests, however, making it once again felt more like a smooth and even experience. I can't say it wasn't genuinely cool to witness the birth of the Assassins. The story has a couple laborious beats, and there are a few brief jumps to see how things are going in the future (I'm not a fan of the Abstergo crap), but Origins' plot is a good one with a few dabs of humor and heart. I only occasionally skipped through cutscenes, and I'm a legendary cut-scene skipper. Even for a cynic like me, witnessing the beginnings of the brotherhood was a bit of a thrill. Yes, the word "creed" is spoken weightily a few too many times (we get it) but I can't say it wasn't genuinely cool to witness the birth of the Assassins. Prequels are tough to pull off without them feeling clunky and overly referential, but the origin story mentioned in the title is handled pretty nicely.